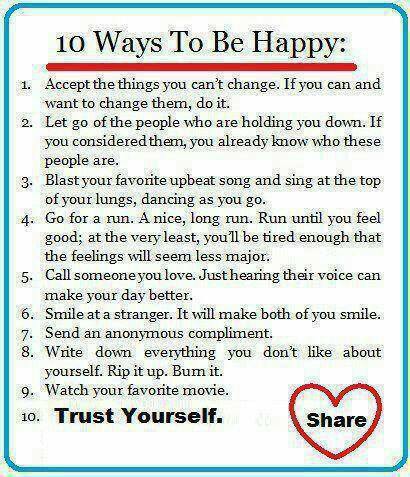 I like the 10 Ways to Be Happy! I am visiting from TGIF Friday hop. I found your blog from the Monday Mingling bloghop. I'm now following you on bloglovin'! Hi there! I'm a new follower from the Friend Connect Blog Hop. I would love it if you would stop by and check me out when you have a spare moment. And thanks for the advice! Staying happy is one of my daily missions! Visiting from the Aloha Friday Hop. 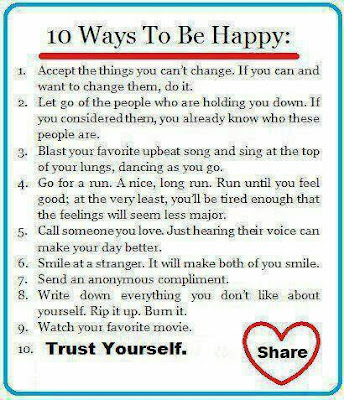 Love this advice and I try to follow most of it, will have to do better lol. Would love if you checked out my blog. Hey girl! I just followed you through the friends hop! Hope you have a great Friday! I also wanted to let you know about my Mommy Mondays Hop! Hope you'll join us! How sweet is that!? I should print this and put it up in my bathroom. Thanks! Just following through the friends hop.